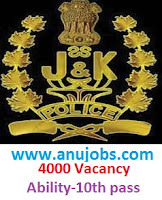 Subject:- Advertisement Notice for the post of Sub-Inspector(Executive/Armed) in J&K Police. The age of the Candidates age should be between 18 to 28 years as on 01-01-2016.Age Relaxation as per Govt. Rules. Candidates should have Degree in this Recruitment process they must have passed Graduation in any discipline from a recognized University. Candidates have to pay Rs. 300/- through online. Candidates will be Selected on the basis on written test, physical endurance test, physical standard test, medical examination. Last Date for Receipt of Application:30-01-2017. 1. MHA letter Nos. 16011/10/2011-PF.4th Dates 10-02-2016 and 27-07-2016. 2.J&K Govt.Home Department Order No. 540 Home of 2016 Dates 07-09-2016. Candidates should have Degree in this Recruitment process they must have passed matriculation/10th from any Government recognized board. Candidates may obtain application form from the Offices of all the district SSsP in J&K/ SSPCID Cell New Delhi on payment of Rs. 300/- in the shape of Demand Draft (DD)/ Postal Order from any of the Branch of J&K Bank/ Post Office payable to Chief Accounts Officer PHQ,payable at Jammu/ Srinagar. Interested and Eligible candidates can apply online through the website www.jkpolice.gov.in from 25-10-2016 to 20-11-2016. Last Date for Receipt of Application:20-11-2016. The age of the Candidates age should be between 18 to 28 years as on 01-01-2015.Age Relaxation as per Govt. Rules. 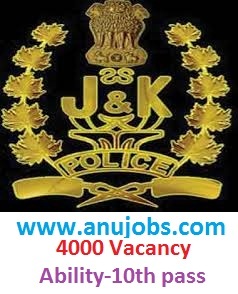 0 Response to "J&K Police Recruitment 2017 Jobs in Jammu and Kashmir apply online for Sub-Inspector Vacancy"